With only two days to go until the start of ARC 2018, there is a hive of activity on the pontoons down at the marina today. The return of the sunshine after yesterday’s heavy showers has also lifted spirits and enabled crews to get on with last minute preparations on deck. This is also a busy day for the World Cruising Club Corporate Members who are here on hand to assist with any last minute questions. YB trackers have been fitted and are now live on the World Cruising website for all friends and family to track individual yachts as they make their way across the Atlantic and on to Saint Lucia. 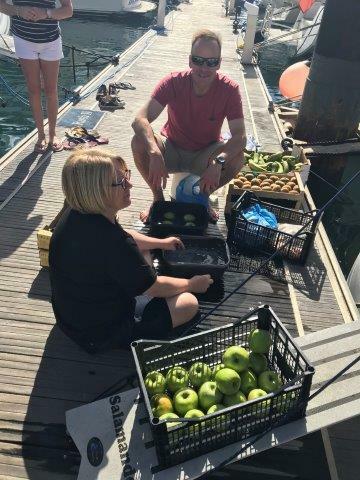 Vans and trucks have been zipping up and down the marina road laden with food and drinks which they deliver directly to the boats on the pontoons. 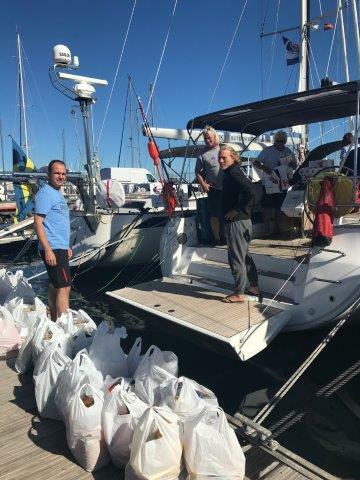 Wolf Knipfer on yacht Baltica has taken delivery of the groceries today and is in the very final preparations before the ARC start on Sunday. With all the crew now here, they are going to enjoy a crew supper together tonight after attending the ARC Farewell Cocktail party being held at Club Nautico. Tonight, it’s a chance to crews to come together for one big final party, the Farewell Cocktail, held at the prestigious Real Club Nautico. As anticipation for start day builds, the clock is counting down and tomorrow’s all important Skippers’ Briefing will give an update on the latest weather and procedures for start day.